I ignore my kids from time to time, too. :) Relationship and time together is really important, but they do need to learn healthy independence and meeting their own needs in an age appropriate way. I firmly think this is good logic. My daughter was my first born so, of course, everything was the end of the world and I babied her way too much. So, now as a teen she is just now learning true independence because i have had to step back from it just a little. My son, however, being the youngest wasn't babied as much because I had already done it all. Skinned neat, slap some peroxide on it and keep moving. I'd pat his head and tell him it's all good, but with my first born I thought she could have internal bleeding or something and questioned every injury she had. Same with homework. I thought I had to be right on top of my daughter for her to do well. However with my son, I had learned that sometimes you have to let the little bird get closer to the edge of the branch alone if it will ever learn to fly. I believe that you can be a good parent without hovering over your children. It is good that you handle this in this fashion. It builds independence. I agree. Sometimes I have to remind myself that my kids are not asking me for help. It keeps me from hovering and teaches them that they can and should ask for help when they need it. This is a great post, thank you! I absolutely agree: kids need to learn on their own so they know they are capable! I love the type of ignoring you described -- it's more like holding back from constantly taking over! 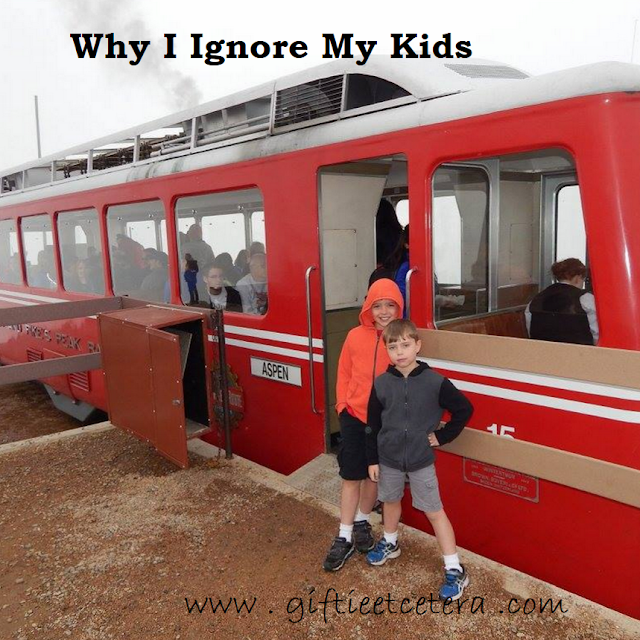 You make a good case for ignoring your kids! I do ignore my son during his timeouts and he comes out when he is done with his hissy fit. I have got to let him be more independent when doing his homework! Stopping by from the Sharefest! This! I do this too, and it's amazing how much my daughter figures out on her own! For me, I always keep in mind that the end-goal is for her to grow into an adult who is capable of taking care of herself and solving her own problems. I agree with this... sometimes as a parent you have to step back and give the kids room to figure things out or entertain themselves. I'm always here for them, but that doesn't mean Mommy solves everything when they can do it themselves! Thanks for linking up at the Manic Mondays blog hop! I do the same thing! When one of my girls falls down or runs into something, I "ignore" them unless they come to me. That's how I can tell if they're really hurt or not. Thanks so much for linking up with us at Share The Wealth Sunday! I agree, there are definitely times for ignoring children, especially when they fall over, though only if they've not actually hurt. I am intrigued by this. I think you make excellent points.